I loved this book! It's so original, with a mix of a book like Graceling and imperial Russia! I loved this book and would love to own it. The whole setting and plot were amazing. I really like the premise for this book. I also love that it's a fantasy. I'm excited to read more about the character Alina. Thanks for having the giveaway. I've heard so many great things about this book especially the world building. Thanks for the chance to win it! I look forward to reading it! Fantasy? Romance? Magic? I can't choose just one reason I've been wanting to read this book for what seems forever. 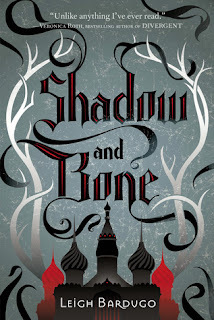 Shadow and Bone sounds amazing!! I'm eager to read this because so many bloggers have sung its praises, and I want to get in on the action for myself. I've heard a lot of positive feedbacks about this book. It's so sad I can't enter. But good luck guys! I've heard so many good things about this book! I am currently reading this one. The writing is excellent! Thank you for this beyond amazing giveaway! I've just heard great things about it! I've heard a lot of great things about this book! I've heard so many good things about this book and it's been on my list for awhile. Thanks for the chance! I borrowed this book from the library and I loved it!!! Team Darkling.